It stands as a low point in the Trump presidency, a moment difficult to justify for even some of President Donald Trump’s most loyal allies. Add Donald Trump as an interest to stay up to date on the latest Donald Trump news, video, and analysis from ABC News. Amid imagery of violent confrontations, and two days after the death of a young woman protesting against a massive white supremacist rally in Charlottesville, Virginia, Trump stood in the lobby of Trump Tower in Manhattan and drew the most infamous equivalency of his time in office. “I think there is blame on both sides,” the president told reporters that day in August 2017. Now, the anniversary today of the Unite the Right rally and counterprotests on Aug. 12, 2017, could test the president’s leadership. Among the big questions has been whether a man who rarely apologizes or looks back has a capacity to respond differently to any similar crises and questions. President Donald Trump speaks about the violence, injuries and deaths at the "Unite the Right" rally in Charlottesville, Va., at Trump Tower, New York on Aug. 15, 2017. Trump seems to recognize the focus on how he will respond. He posted a tweet Saturday morning that took a different tone than his “both sides” comments. The riots in Charlottesville a year ago resulted in senseless death and division. We must come together as a nation. I condemn all types of racism and acts of violence. Peace to ALL Americans! He also tweeted about lower unemployment rates among African-Americans and Hispanics, which has become part of his campaign stump speech. I am proud to have fought for and secured the LOWEST African American and Hispanic unemployment rates in history. Now I’m pushing for prison reform to give people who have paid their debt to society a second chance. I will never stop fighting for ALL Americans! No one knows quite what to expect today. 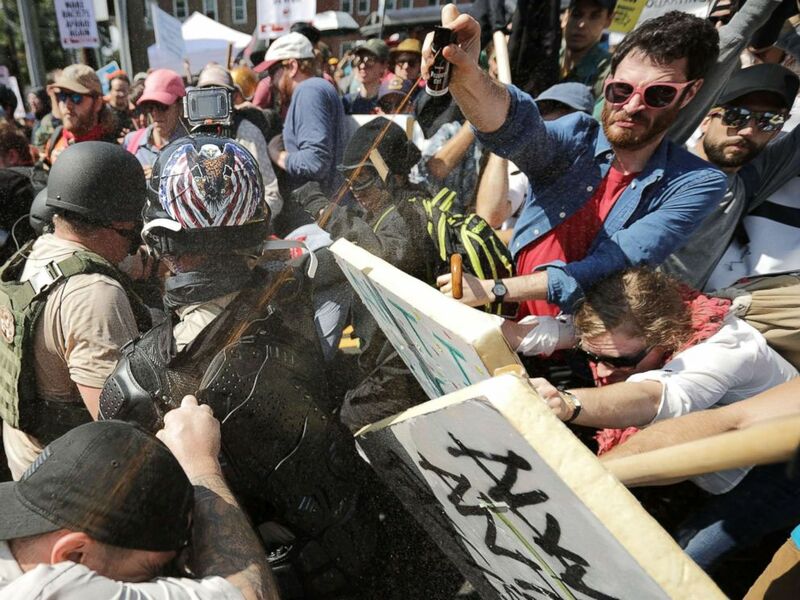 Virginia declared a state of emergency in advance of the anniversary, and amid peaceful vigils by student activists on Saturday there was a brief confrontation between officers in riot gear and protesters angry over the heavy police presence. But the tensest scenes could play out far closer to the White House. A second white nationalist rally - and another counterprotest -- will take place in Washington today. The white nationalist march is set to conclude at Lafayette Park, essentially the president’s backyard, if he wasn’t spending the weekend at his golf course in New Jersey. But his reactions to last year’s events – and aspects of his conduct in the year since them - loom large. Charlottesville’s new mayor, who is black, maintains that the president’s attitude toward race is contributing to a hostile climate in her city and beyond. White nationalists exchange volleys of pepper spray with counterprotesters as they enter Lee Park during the Unite the Right rally on Aug. 12, 2017, in Charlottesville, Va.
“I just think that we all very aware of what type of person currently occupies the White House and the terrorism that has faced the nation because -- partly because he's there,” Mayor Nikuyah Walker said on CNN Friday. Trump has frequently said he’s the “least racist person.” In recent months, he’s made a particular effort to consult with African-American pastors and has begun a new effort to pursue criminal-justice and sentencing reform. But the president’s words have so often eclipsed any actions. Just a week ago, Trump insulted the intelligence of one of the nation’s most prominent black athletes, LeBron James, as well as the black journalist who interviewed the basketball star, Don Lemon. This week also marks the launch of a book by the woman who was once the president’s highest-profile black adviser, Omarosa Manigault Newman. The book claims – without direct evidence – that the president used the n-word. Manigault Newman writes that she came to a “growing realization that Donald Trump was indeed a racist, a bigot and a misogynist,” according to The Guardian, which obtained an early copy of the book. Even after a year, Trump has still not specified whom he considered to be among the “very fine people” who joined the white-supremacist rally in Charlottesville. His comments drew widespread condemnation from Trump allies in Congress and beyond and it seemed at the time they might spur multiple White House resignations. 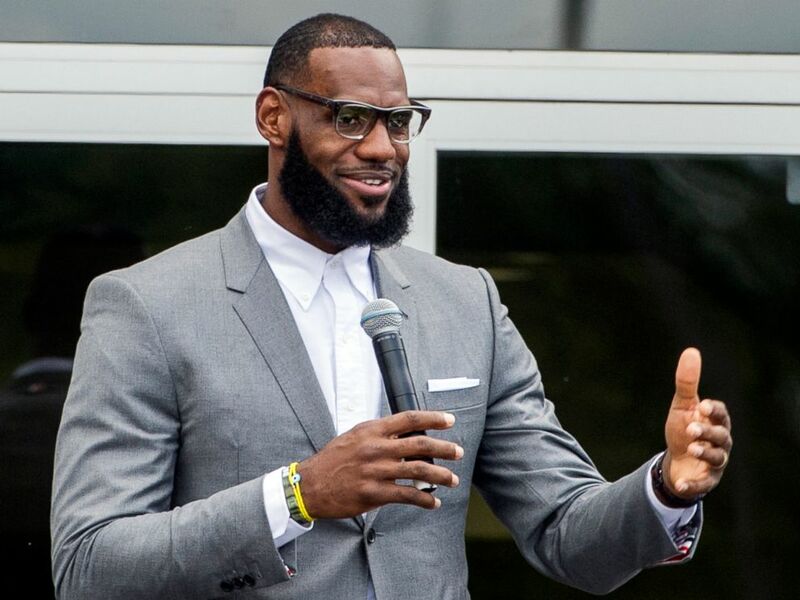 LeBron James speaks at the opening ceremony for the I Promise School in Akron, Ohio, July 30, 2018. That talk dispersed as quickly as the crowds in Charlottesville. Some of the most prominent critics of Trump’s conduct at the time have since grown far closer to the president, and rarely now publicly break with him. 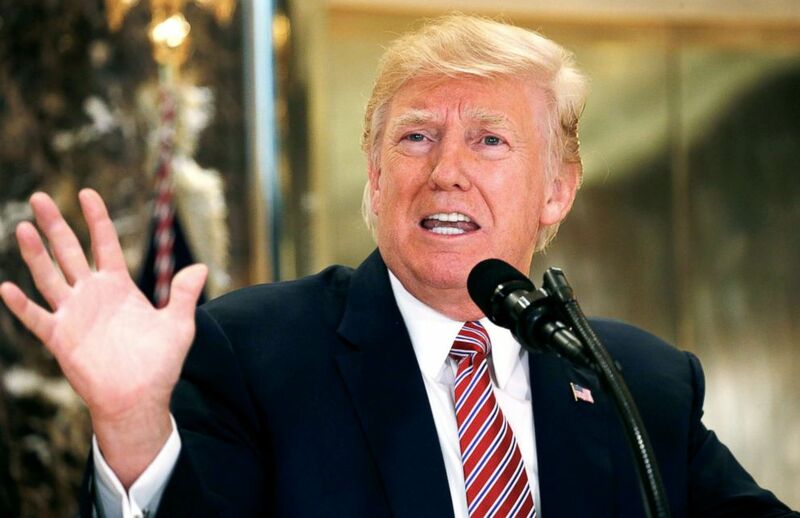 In the scope of his contentious time in office, Trump’s reaction to Charlottesville registers as an unforgettable moment, though one obscured by subsequent events. His basic answers on issues involving race haven’t changed all that much. Less remembered from that Trump Tower news conference a year ago is that the president also claimed that racial tensions would be lessened with a growing economy. He also condemned what happened in Charlottesville, though with an important caveat. “I thought what took place was a horrible moment for our country -- a horrible moment. But there are two sides to the country,” Trump said. If something happens around Charlottesville’s anniversary, will it force the president to pick a side? If so, it’s unclear where Trump would come down.